Grannies Vs. Teens: Who's The Scariest Driver? Who is America's greatest driving threat — reckless teen drivers on cell phones or blue-haired hunched-over-the-steering-wheel grannies? TheAutoInsurance.com breaks it down for us with some good ol' fashioned infoporn. Everyone loves eating beets infoporn. Luckily, car insurance sites are veritable treasure troves of infopornographic charticles, lists and graphics. The latest pretty picture with numbers atop it is this look at who's more scary on the road — teens or old people. 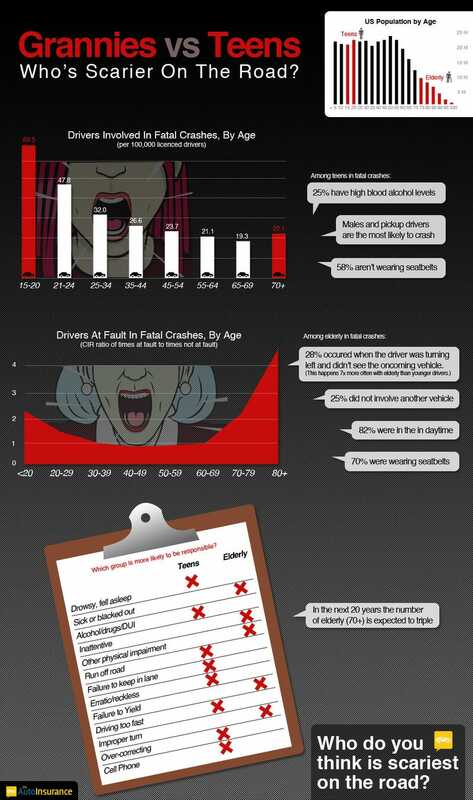 According to stats compiled by TheAutoInsurance.com both old people and teens are horrific behind the wheel. But which group's worse? They claim that per every 100,000 licensed drivers, there are 69.5 drivers between the ages of 15-20 that are involved in a fatal accident. Contrast that to 22.1 drivers 70 years and above. But before we point the finger at teenagers and order them to get off the road, something else should be noted. Of those drivers involved in a fatal crash, those 80 years and over were more than four times as likely to be at fault than not. Those under twenty? Only more than two times as likely.